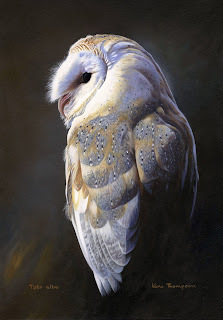 I don't think there is a more popular bird than the Barn Owl. I painted this study and wanted to get that feeling of late summer evening light which casts such deep blue shadows. Sometimes in the summer, when I am leaving the stables, I see a Barn Owl, quartering a field or flying in to perch on a fence post. They are so instantly recognisable because they appear so white in flight. It is easy to see why they were once believed to be the restless spirits of the dead wandering the woodland edges. It is a real treat to see these owls and to know that the farmer whose land the bird is nesting on has had the foresight and interest in wildlife to leave some areas of wild meadow and headland undisturbed where they can hunt. Maybe with such care these beautiful owls will flourish in our countryside and become a more common sight.